It's that time of year when I love to bake cookies and other holiday treats! 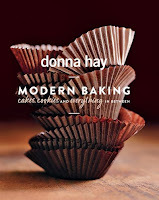 So it was perfect timing when the new cookbook MODERN BAKING: CAKES, COOKIES AND EVERYTHING IN BETWEEN by Donna Hay arrived on my doorstep. Granted my arm almost fell off when I picked up this sturdy book. It's huge in the very best way, about 400 pages; and it looks like a coffee table book. This is one amazing cookbook for bakers! MODERN BAKING is absolutely beautiful! The photographs are even swoon-worthy. I swear I gained a pound or two just drooling over them. 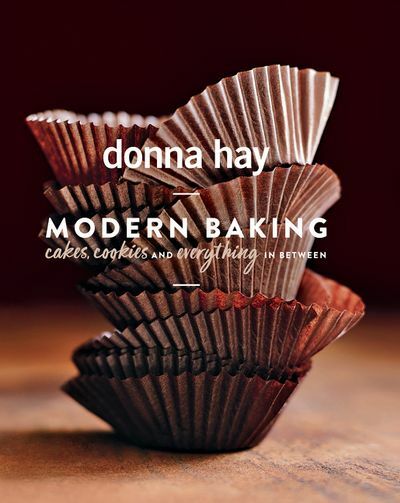 Donna Hay, author of twenty cookbooks, has definitely outdone herself with this one. There are more than 250 recipes; and, as the author states, "this book is what I like to think of as my modern baking bible." MODERN BAKING is even organized extremely well. The chapters are: Chocolate; Caramel, Toffee, and Coffee; Sugar and Spice; Fruit and Berries; and Milk and Cream. Now that I have your attention...! Just kidding, but I thought it was funny that she began this book with Chocolate! As someone who has less time than ever to bake this holiday season, I absolutely love that each chapter has a "Quick Fix" section. There is also a section in each chapter called "Fresh and Light" which definitely appeals to me too! I could write pages just listing the incredible recipes... and I'd still be leaving some out. Suffice it to say, that I am not a huge chocolate lover, so the caramel and fruit sections were my favorites. What I really appreciated is that there are traditional favorites in this book, but there are also twists on classics and entirely new (and interesting) recipes. I can't wait to add a few of these recipes to my routine Christmas baking. There is a Choc-Toffee Pretzel Bark that's screaming out to me as well as a Peanut Butter Fudge that looks amazing. And don't even get me started on the White Chocolate and Rhubarb Jam Drops! My husband grows rhubarb for me, and that recipe looks delicious. There really is something for everyone in MODERN BAKING from the wide variety of recipes, to the quick ones, to the healthy ones. As a result, I think it's a perfect Christmas gift for the baker in your life! Thanks to the publisher for providing a review copy of this cookbook. Oh my! I love baking and feel sure I could find some recipes in this book. The cover is gorgeous!